Dispatched from and sold by just-the-games. Comment: Some wear to the outer card case from storage.All of the discs are in very good condition. The Flying Circus is where Monty Python started - 4 series of TV shows aired between 1969 and 1974 in the UK. Dubbed 'The Fathers of Modern British Comedy', it was seen as the start of a new generation of TV comedy when it hit the mainstream, and was certainly seen as controversial in its day. Topical issues were included but silliness was the main theme, and seeing everyday stuff at a tangent was the order of the day. The guys classical education also is reflected in some of the more esoteric pieces. Now with a huge cult following, the Flying Circus appeals to both young and not-so-young. 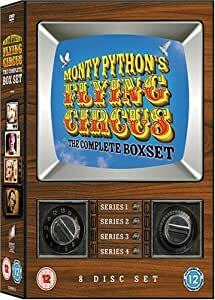 This is a review of the 2012-re-release of the "Complete Boxset" (Monty Python's Flying Circus - Complete Series [DVD]). 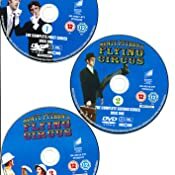 In case you were wondering (like I was) how this release differs from the 2008-release (Monty Python's Flying Circus - The Complete Boxset [DVD]  apart from the much lower price), this might help in your purchasing decission. On the first glance, the re-release seems to be a stripped down, low budget edition of the 2008-version: different covers, shorter running time, and no foreign subtitles - but no! Actually only the packaging has been slightly modified. While on the Amazon-page only the DVD-case is shown, the DVD actually comes in a slip-case which is similar to the original release. The difference is, that this is no more a die-cut sleeve and instead of having a multi-fold dvd-tray this is simply a (big) armary case. The discs themselves are identical to the 2008-version (they even have the same number and year on the label). This means it has Arabic, Croatian, Czech, Danish, Dutch, English, Finnish, French, German, Hindi, Hungarian, Icelandic, Italian, Greek, Norwegian, Polish, Portuguese, Romanian, Slovene, Spanish, Swedish, Turkish subtitles and the first season is also dubbed in Polish and Hungarian (which still leaves me wondering if this is part of the joke or of its a true hungarian translation) and also all extra features are left intact: "Before the Flying Circus", "Conquer America", "Animated Gilliam" and "Politically Incorrect", so it has an overall running time of 1327 minutes (like the original release). So, get it if you don't have it - this is the real deal! Actually the whole thing kicked off on the evening of my sixth birthday though I was blissfully unaware of it. It was some time later, probably through BBC repeats, that I found out about this series and though I was eventually well versed with many of the best known sketches, animations and sayings of the show, it is only now that I finally get to see the entire series from start to finish. What you make of it is your business. Suffice to say that not every single sketch was that funny. Some of it was surreal, some of it was clever, some of it was mackerel flavoured with a hint of rosemary, but it cannot be denied that these six folk picked the ball up that had been kicked about by the Goons and those Oxbridge folk of which most of the Pythons were members at one time or another, and gave it a thoroughly good kicking. Before the movies and all the merchandising was this; Monty Python's Flying Circus. Anyone with the slightest interest in media history, anthropology, philology or linguistics HAS to be familiar with this as so much now hinges on, or refers back to it. And now for something completely expected.. The M'gaqui tribe of Eastern Umpopoland have a law which states that all cattle must be named individually and that name must be Gnaqqwai, which translates roughly as "Daisy." Breeding bulls also have the same name, but prefixead by G'tan, which means "Mister." 5.0 out of 5 starsI have watched it all and it is really rather good. Although in some ways this is a product of its time that can only be fully understood by those that lived through them, it equally has a timeless quality. That is due to the diversity of sketches that include the very topical, plenty of satirism that is every bit as relevant in 2012 and of course downright silliness. This is British humour at its best. Inevitably some sketches will have you laughing out loud (and far more of them than just the famous ones) and others might leave you blank faced. In a similar way, some episodes are consitently brilliant and others are more patchy, with the odd episode falling flat. (This is still true for the short 6-episode series 4 sans John Cleese. Although painfully apparent at first, I hardly noticed his absence by episode 4 and there are some brilliant sketches.) Having said that, the only way to fully appreciate Monty Python's brand of humour is to watch this whole set. Otherwise you are never likely to see some of the great sketches and will miss the effect of the integrated episodes that have recurring themes or motifs. Personally, I love this set much more than the films and there are just so many episodes here for a very reasonable price. The bonuses include one very good documentary about the pre-Python days and another documentary about the success of Monty Python in America. The best extra is the "politically incorrect" sketch, which was dropped after its first showing at the beginning of a series 3 episode and is only now available as a stand alone poor quality copy. It is still a brilliant sketch. Excellent set, well done Sony!